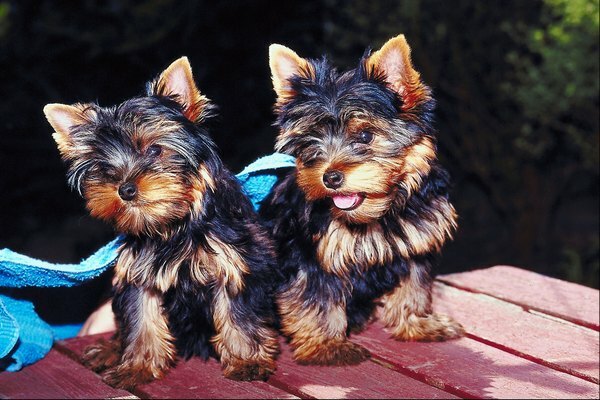 The tiny size of Yorkie puppies makes them especially vulnerable to worms. Once you bring your puppy home, it’s up to you to figure out what he needs. One of the most important things you can do for any puppy, especially one as tiny as a Yorkshire terrier, is to make sure he doesn’t have any kind of parasitic worms. Your Yorkie puppy’s general appearance can give you a good idea as to whether or not he has worms. One of the most obvious signs is a bulging potbelly. This isn’t baby fat, it’s bloating caused by the presence of roundworms. He may also have other signs that clue you in to the presence of one or more types of worms, such as a dull, rough coat or chronic diarrhea. With certain kinds of worms, such as hookworms, the diarrhea may even have blood in it, and your pup can die from this if he doesn’t get immediate treatment. One sure way to know if a baby Yorkie has worms is if you actually see the worms. The most common worms you’ll see in a puppy’s poo are roundworms and tapeworms. Roundworms are easy to identify; they look like long, pale strands of spaghetti. Am infested pup may also vomit up some of these worms. Tapeworms are a bit harder to spot, but fresh segments look like tiny, wiggling grains of rice and can be seen in the puppy’s stool or on his rear. Dried tapeworm segments are flat and brown and tend to look something like sesame seeds. Your vet can tell for sure if your Yorkie puppy has worms by analyzing a stool or blood sample. The stool sample will show signs of intestinal worms such as roundworms, hookworms and tapeworms. A blood sample will tell your vet if your puppy has heartworms. Since heartworms take time to develop, your Yorkie puppy is not likely to have any adult heartworms yet, but your vet will still want to screen the pup before starting him on heartworm preventive. Intestinal worms are much more common, and most puppies have them, but getting rid of them is usually fairly easy. After a blood test, your vet will put your puppy on a monthly heartworm preventive to kill any immature heartworms, called microfilariae, that might be in your pet’s bloodstream. Your vet can also prescribe the right medicine to kill any intestinal worms your Yorkie puppy may have. Many heartworm preventives bundle common intestinal wormers with the heartworm medicine, keeping your pal free of most kinds of worms. Since Yorkie puppies are so tiny, always get worm medication from your vet, to prevent an accidental overdose, and never treat him with anything your vet didn’t prescribe. Do Worms Affect the Weight of a Husky? Should You Isolate Cats With Worms? When Is a Puppy Ready for Adoption? What Does It Mean if a Dog Cleans Another Dog?